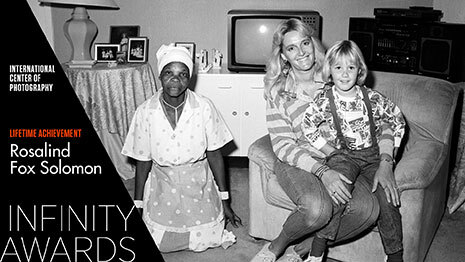 Since 1985, the International Center of Photography has recognized outstanding achievements in photography with its prestigious Infinity Awards. Since 2013, MediaStorm has been honored to partner with ICP and Harbers Studio to produce films that honor each awardee’s contribution to the field of photography and visual culture. 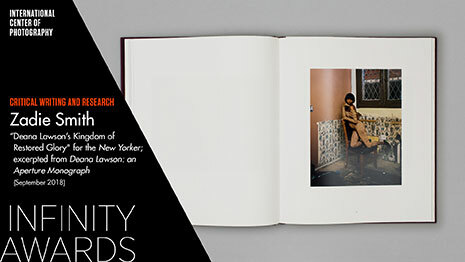 This year’s winners are: Lifetime Achievement: Rosalind Fox Solomon; Critical Writing and Research: Zadie Smith, “Deana Lawson’s Kingdom of Restored Glory” for the New Yorker; excerpted from Deana Lawson: an Aperture Monograph (September 2018); Art: Dawoud Bey; Emerging Photographer: Jess T. Dugan; and Special Presentation: Shahidul Alam. 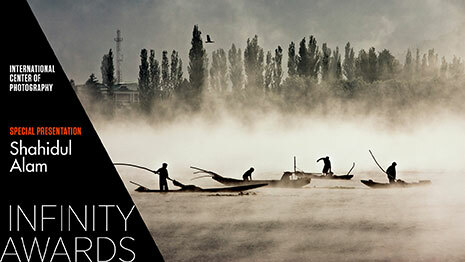 The International Center of Photography’s Infinity Awards celebrates the outstanding achievements of individuals in photography. 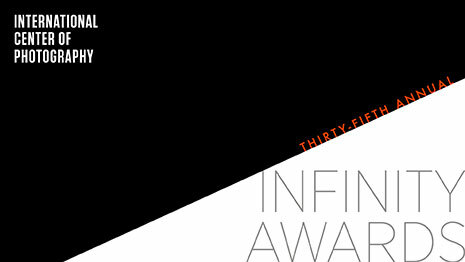 These films premiered at the Infinity Awards gala on April 2nd in New York City, and are subsequently used by the organization for promotion and fundraising. As is the case each year, this year’s winners have huge and significant bodies of work that are relevant to issues affecting society today. The films are commissioned for the ICP Gala, which has a strict time limitation of 5 minutes per film, but each year we develop films of longer durations to reflect a more authentic story about the photographer and his/her process. This year, we wanted to make sure to include as much about the work as possible, to create a story that truly honors the artists. In addition, we faced one of our greatest challenges to date in film production–we lacked access to much of the honored photographer’s work and were unable to record any interviews for the narrative. This required us to create an entirely new approach for the film on Zadie Smith. For the films, MediaStorm developed a treatment and interview process that explored not just why each work was significant, but how we would convey its intent. We also pored over relevant news items and archives to tie those back to the work. We were fortunate to capture additional b-roll of some of the honorees working in the field and when that was not possible, we sourced footage of them working to demonstrate their process. Although we weren’t able to get an interview with Zadie Smith, we were able to read an excerpt of her work and use that as a voiceover for the film. We then sourced interesting footage to accompany the voiceover in addition to some of Deana Lawson’s stunning imagery. The film premiered on April 2, 2019 at the ICP Infinity Awards Gala in New York City. The film was a special feature of the evening, and a critical fundraising tool. Shahidul Alam is a Bangladeshi photojournalist, teacher, and social activist. A TIME “Person of the Year”, he is celebrated for his commitment to using his craft to preserve democracy in his country at all costs. Watch it now. Jess T. Dugan uses photography to explore gender and sexuality. 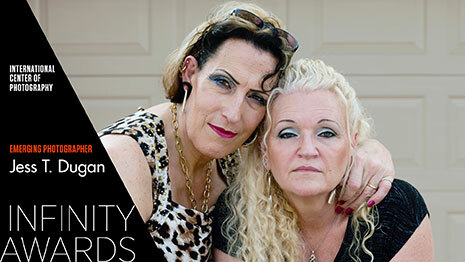 Her celebrated book, “To Survive on This Shore”, is a collection of photographs and interviews that document the joys and challenges of the lives of trans people over fifty. Watch it now. 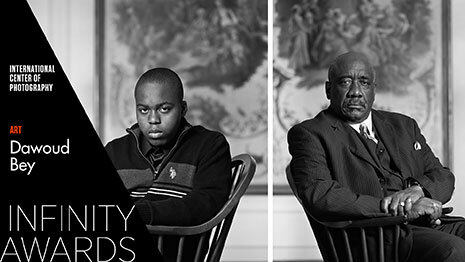 Dawoud Bey’s photographs and process have been described as a “civic act of seeing”. He says his photographs of marginalized people and histories are all a way of giving these subjects greater value than they’re traditionally given. Watch it now. Writer Zadie Smith pays homage to photographer Deana Lawson in the artist’s first Monograph. In this essay, Smith describes how Deana Lawson’s work uniquely places individuals from the African Diaspora in a “kingdom of restored glory”. Watch it now. Rosalind Fox Solomon’s photographs are both a mirror to self-transformation; and a testament to some of the most important moments in history, including early photos of the AIDS Crisis, apartheid in South Africa, and life in the West Bank. Watch it now.